Day 1 – Thursday 11th August 2016: Arrive into (Saigon) Ho Chi Minh City, Meet & greet on clearing immigration & customs, then transfer to the hotel in the city centre (we’ve allowed for individual transfers subject to port of departure and time of arrival). Subject to your arrival time and check-in at hotel, rest of the day of arrival is “free time” in Ho Chi Minh City at your leisure to do some local exploring. Overnight at the “HUONG SEN Hotel” # 66-70 Dong Khoi, District 1. Ho Chi Minh City. Tel (84-8) 38291415. We’ll all meet tonight at 19:30 at the roof top garden (bar-restaurant) of the Huong Sen Hotel after you’ve had time to settled in your room. Day 2 – Friday 12th August (B/L): Ho Chi Minh City – a full day sightseeing tour starting with a walk to Post Office and Roman Catholic Church (Notre Dame Cathedral), Presidential Palace, War Remnants museum etc. (L) PM visit to include a local Chinese Temple and Wholesale Market in Chinatown area. Overnight on bed & breakfast basis at HUONG SEN Hotel. Day 4 – Sunday 14th August (B/L): Ho Chi Minh City to My Tho – Visit to the Mekong Delta with a full day of sightseeing, the floating markets and a general visit of the local area including a stop off at a fish farm. Visit a Mekong Island and enjoy some local fruits and local tea refreshments (L) Lunch is a local delicacy “Elephant Ear Fish”. A late afternoon return to Ho Chi Minh City, via the ANZAC Bridge that spans the Mekong, built with Australian Aid funding. Overnight bed & breakfast basis at HUONG SEN Hotel. Day 5 – Monday 15th August (B/L): Depart Ho Chi Minh City for Vung Tau by road. 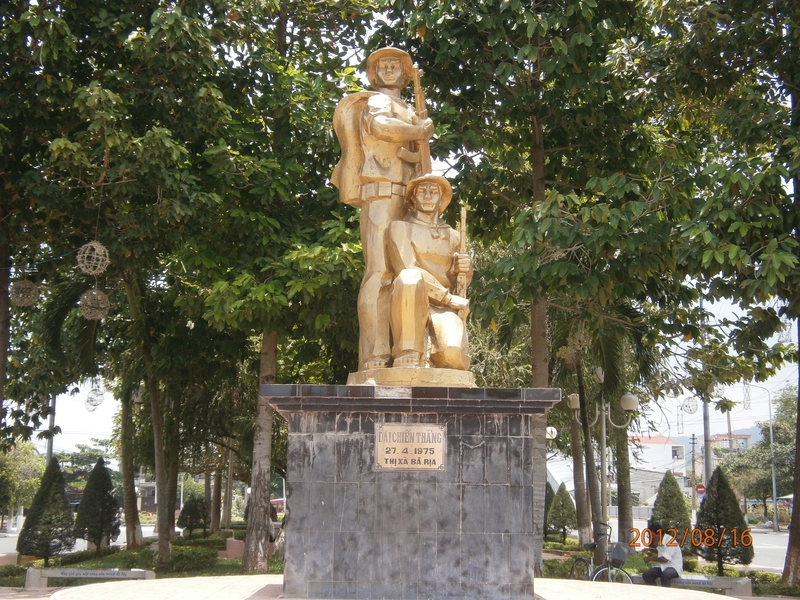 Journey will be via Bien Hoa with a visit to the local museum to view some war relics and the original Long Tan Cross. On arrival Vung Tau, check in at the GRAND Hotel. Address: # 2 Nguyen Du Phuong 1, Vung Tau, Vietnam. Tel: (+84-4) 38568888. After checkin we’ll meet in the lobby (our local guide will advise time) then off to enjoy a late restaurant lunch. (L) After lunch a local sightseeing tour around Vung Tau including the old airfield – today’s helicopter base for the off-shore rigs. The French Governor’s White Villa (now a museum),the Jesus statue and town area. Site of the original Harold Holt – Peter Badcoe Club area, now the Department store area of the Imperial Hotel located on Back Beach. Overnight Vung Tau – GRAND Hotel on a bed & breakfast basis. Day 6 – Tuesday 16th August (B/L): Early 08:00 start for a full day visiting Baria township, the Orphanage, Long Phuoc, Nui Dat, FSB Horseshoe, Hoa Long village, Dat Do village. Lunch (L) at local restaurant on the beach in – Long Hai (L) seafood style. Then visit the Minh Dam secret zone in the Long Hai Hills, in the adjacent area as “Charlie Valley” where 24 men of 9 Pl. 8RAR left their FSB ISA on the 14th Feb,70 to engage the Vietnamese force in an ambush. Returning to Vung Tau late afternoon. Overnight Vung Tau – GRAND Hotel or similar on a bed & breakfast basis. Day 7 – Wednesday 17th August (B): Today is free at your leisure. An opportunity to visit old haunts in and around “Vungers”, Maybe a short taxi ride and swim down on Back Beach, a lazy day on the beach with a few cold Ba Ba Ba’s You’ll never recognize the beach area these days gone (only around 5 years ago) is Harold Holt Club later to be known as the Peter Badcoe VC Club. On the spot today stands the Imperial Hotel and Department store. Across the road though you can still get a good local meal in one of the many beach pavilions and soak in the cool sea breeze. Or you can take in a little local shopping, whatever suits your mood. I’d recommend a visit to Tommy’s 3 Bar & restaurant run by an ex 6RAR member Glen Nolan, a great host and friend. Overnight Vung Tau – GRAND Hotel, bed & breakfast basis. Day 8 – Thursday 18th August (B/L): Morning departure after breakfast to visit today’s village of Binh Ba located 5 kms north of Nui Dat (relocated after the battle to the left of the main road) where between the 6-8th June 1969 during Operation Hammer a fierce action occurred between 5RAR and a combined Vietnamese Force from 33 NVA Regiment and elements of D440 Provisional Mobile battalion. It involved house to house close quarter fighting with our forces using infantry, armour (Tanks + APC’s) and helicopter gunships to rout the Viet Cong force. The opposition force left the area soon after their heavy losses that day. Lunch (L) in Baria and time to visit the local markets and flower stores before your afternoon visit to the Long Tan Cross site for 50th Anniversary Memorial Service scheduled for 15:30 hours in what’s left of what was once was the rubber plantation where the battle of Long Tan took place, time to reflect. After the memorial service, return to Vung Tau. Overnight Vung Tau – GRAND Hotel, bed & breakfast basis. Time to enjoy a refreshment or two with your fellow travelers at one of the many local watering holes……see you at Tommy’s 3 for a pre dinner ale. Tonight there is a Gala Fellowship Dinner for all returning Veterans with special visiting guests from Australia and local one time Vietnamese opposition force members. Details follow once all finalised. Day 9 – Friday 19th August (B): Leave Vung Tau by road for Saigon, destination Tan Son Nhat airport (for those undertaking the Long Tour) to connect with your flight onto Danang, then onto Hoian by road. For those on the Short Tour, drop off Tan Son Nhat for connection to your exit flight Saigon/Australia or beyond to suit your onward flights be it home, or your next Asian destination. Accommodation in tourist grade class hotels on a share twin basis throughout the programme. Private land transfers by air conditioned vehicles. Local English-speaking guides. Admission fees to indicated sights in itinerary. Meals as stated in the itinerary B breakfast /L lunch or D dinner. All government taxes and service charges. Flight reconfirmations for ongoing travel. Fully escorted by a Qualified Australian Battlefield Guide. Gratuities to local Guides & Drivers. Vietnamese Visa issue for Australian passports Holders. International air travel to and from Vietnam. (Please refer our special airfare offers ex AU) Any service not detailed in the daily itinerary. Early check in and Late check out Other meals not detailed in the itinerary. Refreshments with meals. Comprehensive travel insurance essential. Other service not mentioned. Items of a personal nature i.e. room service, laundry, telephone calls local or international, use of internet facilities although most hotels offer free connection, subject to location. Note: If you wish to have sole use of a compartment on the three sectors being travelled by rail. The extra on a share twin basis is AUD 246.00 pp shared x two. Single Room: Is available please request cost at time of booking if you prefer a sole occupancy of a room on tour.